and a number of attractions sure to captivate the entire family." 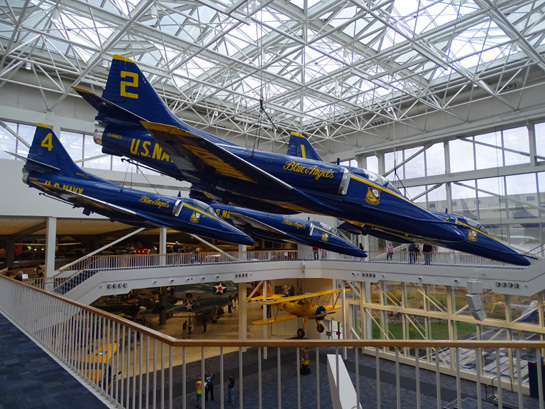 We liked this museum so much that we visited at least four times during our five-week stay at the nearby Blue Angel Naval Recreation Area. 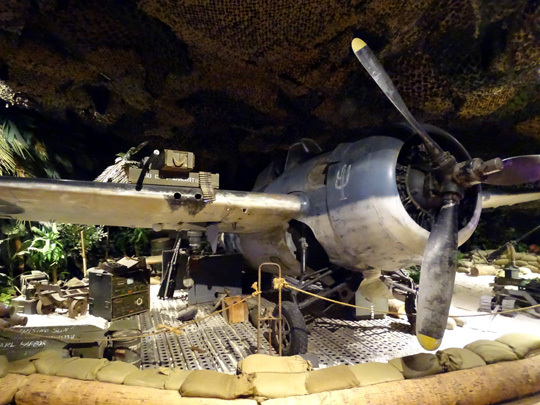 If you're camped at Oak Grove on the NAS Pensacola base, it's even more convenient to visit -- the museum is practically across the road. 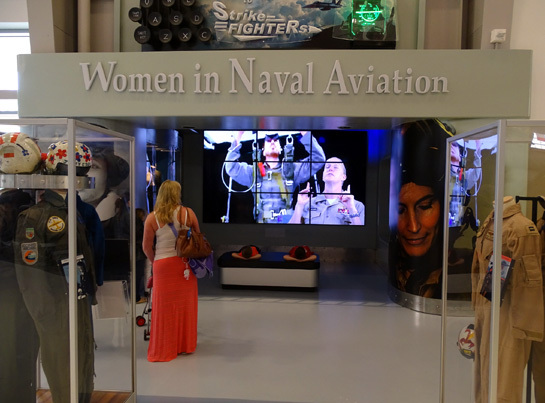 During our first visit we were almost overwhelmed by all the aircraft and exhibits on display. 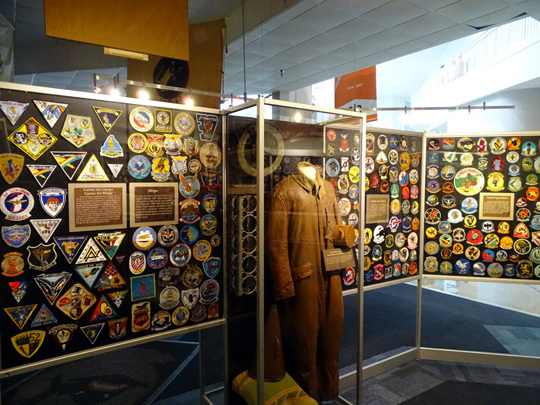 Jim commented that he liked it even more than the Smithsonian's National Air & Space Museum in Washington, D.C. 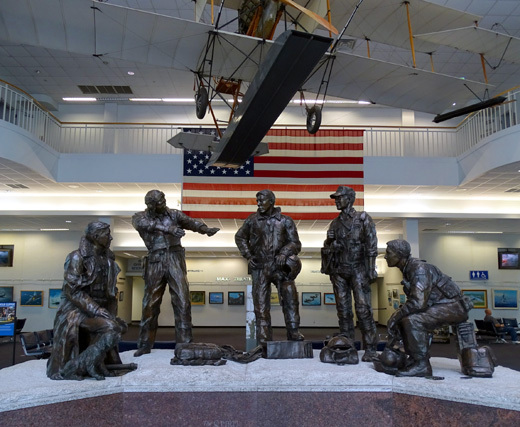 The large "Spirit of Naval Aviation" sculpture in the lobby depicts pilots from WWI to Desert Storm. 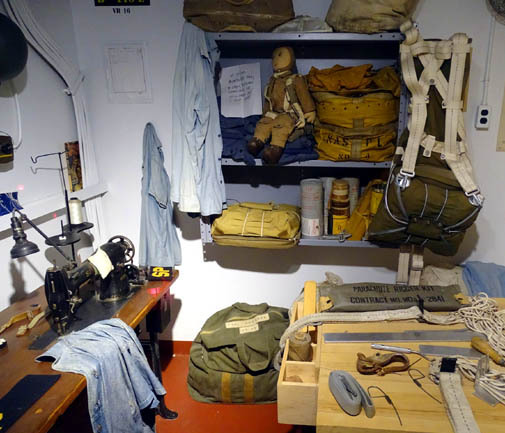 But you don't have to have military connections to visit this awesome museum. It is FREE and open to the public almost every day of the year. 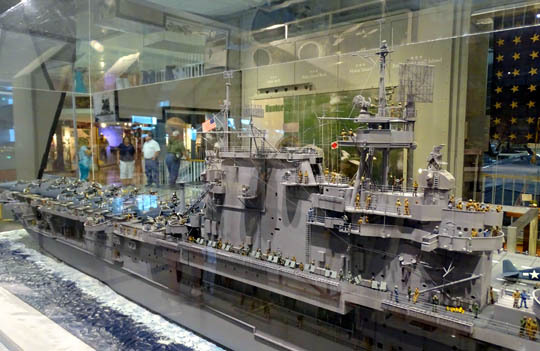 It is so popular that millions of people visit the museum each year. Because the exhibits are spread out over two large buildings (the main one has a very high ceiling and second-floor balcony), the museum didn't seem that crowded to us on any of our visits. Tuesdays and Wednesdays in the spring are the most crowded days at the museum. 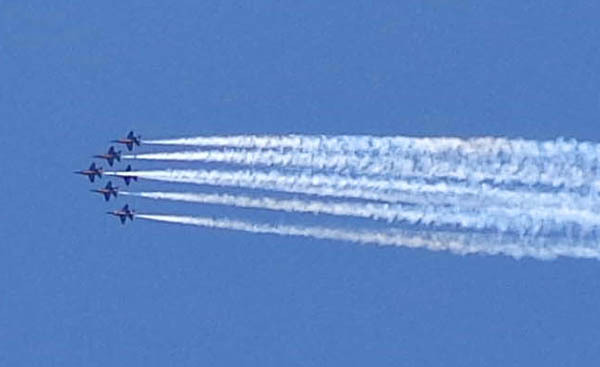 That's when the Blue Angel precision aerial team has its practices. 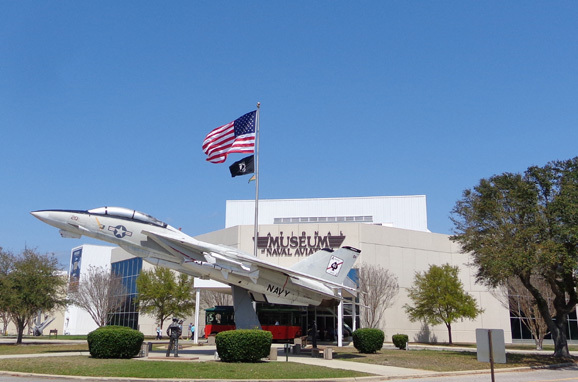 Viewers are directed to the museum parking lot and while they are there, many of them go into the museum before or after the air show. 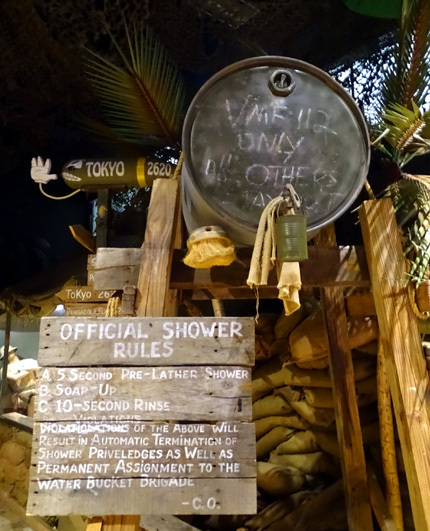 Although we often watched the practices from various places on base, we avoided going inside the museum on those days. 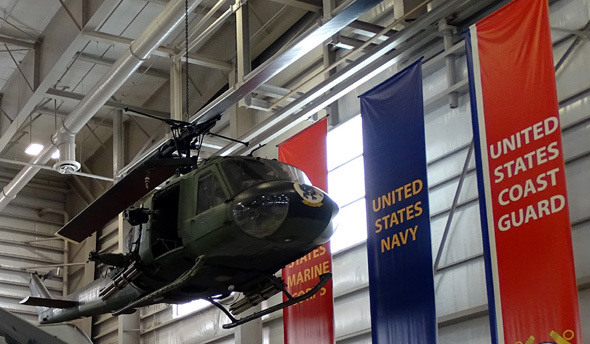 Four A-4 Sky Hawks hang from the ceiling in the auditorium. 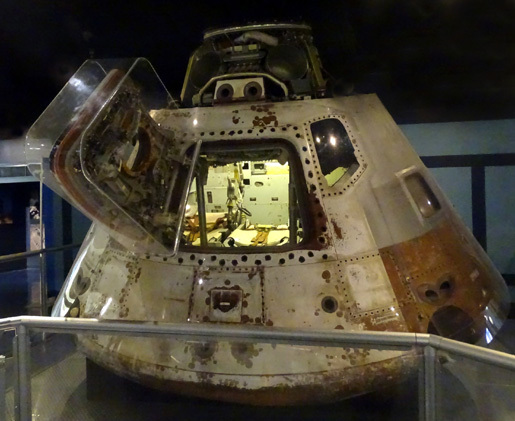 There really is a lot to see and do in this museum. Most kids from 3 to 103 will enjoy it. 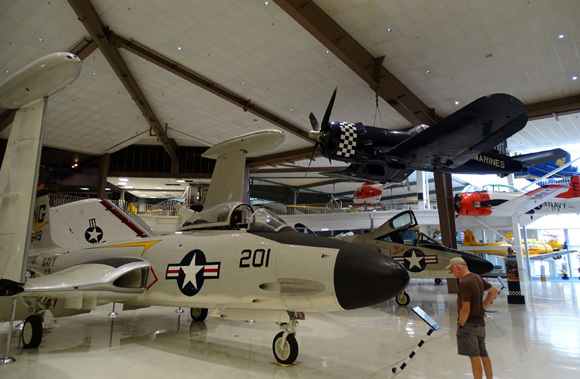 You can spend all day perusing the exhibits, examining the numerous aircraft on the floor and suspended from the ceilings, watching IMAX movies (gotta pay for those), or playing with various simulators (some of those have a fee, too). The movies are $8 per person or $15 for two. 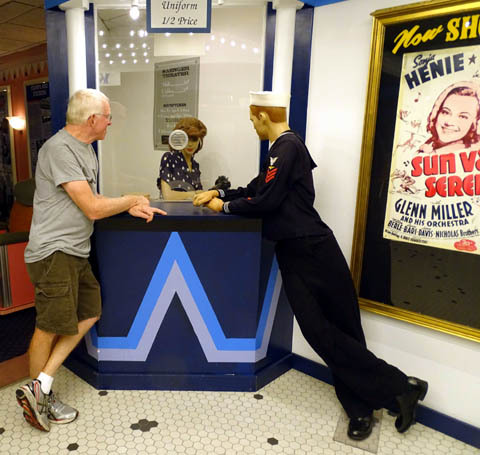 Jim watched a good WWII movie and we both watched one about how the Blue Angels train. That gave us even more appreciation for the skills the pilots and their support team possess. 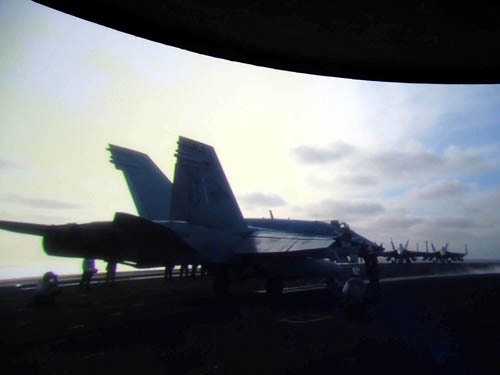 The only one we did, which was free, was the Virtual Flight Deck where we felt like we were on an actual aircraft carrier's deck when helicopters, jets, and other planes were coming and going -- our seats shook, the wind blew, and it was realistically noisy (next photo below). 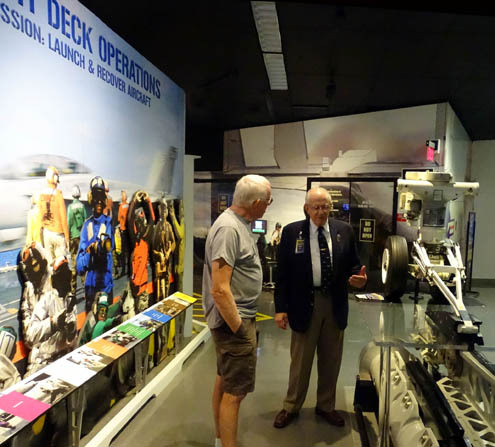 On our third visit to the museum we joined a small group for a 2+ hour tour narrated by Lt. Col. Terry Bryan, a retired Marine described by another volunteer as the museum's most popular tour guide. He was fascinating and we got to talk to him alone for a while after the tour. More and more folks joined us as we walked around the first floor and out to the hangar where the more modern planes are displayed. 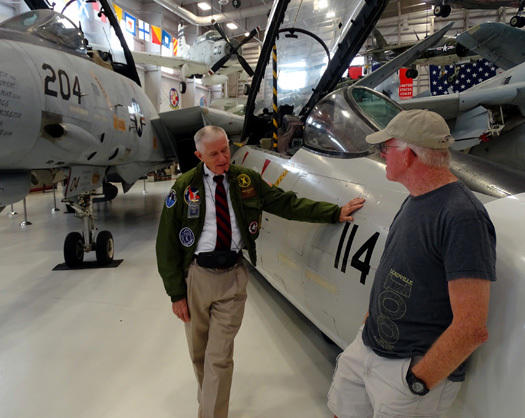 Terry was very detailed but interesting as he told us about the different Naval and Marine aircraft, regaled us with tales of "bad air days" and good, described different WWII battles, etc. A former runner, he now does biathlons (walks and rides), takes adventure vacations with his lady friend (he's a widow), and climbs mountains in the Andes, Alps, etc. Very cool guy and we learned a LOT that day. If you go to the museum we recommend you join one of the tours. Our mistake was not doing this the first time we were there, although it's also fun to explore on your own. 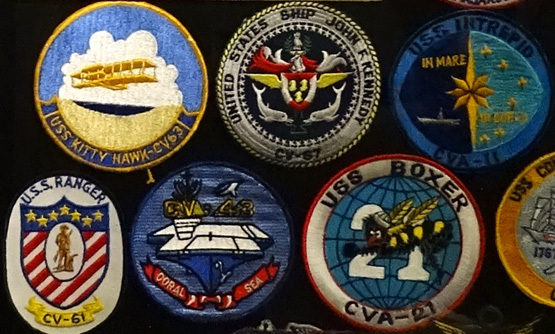 Aircraft range from the earliest modes of flight to spacecraft retrieved by Navy vessels. 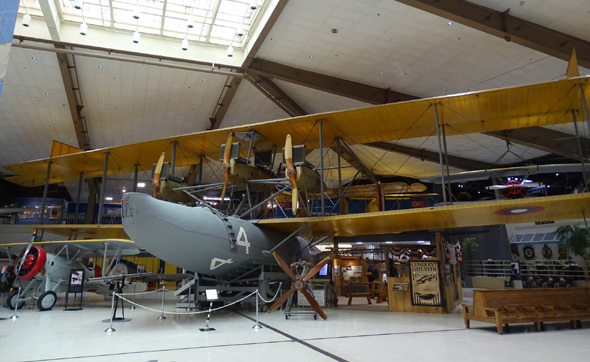 Above and below: This NC-4 (Navy/Curtiss) was the first plane to fly nonstop across the Atlantic. The year was 1919. 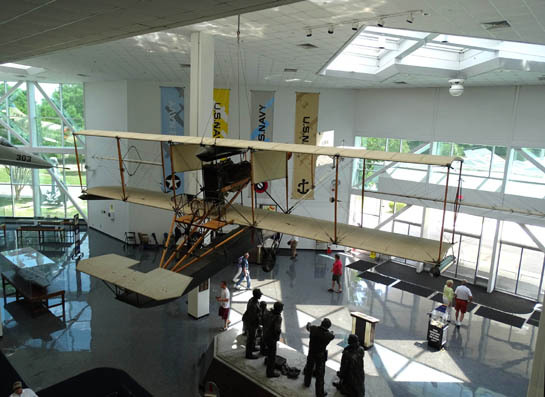 With a wingspan of 126 feet, it takes up a lot of room at the museum! 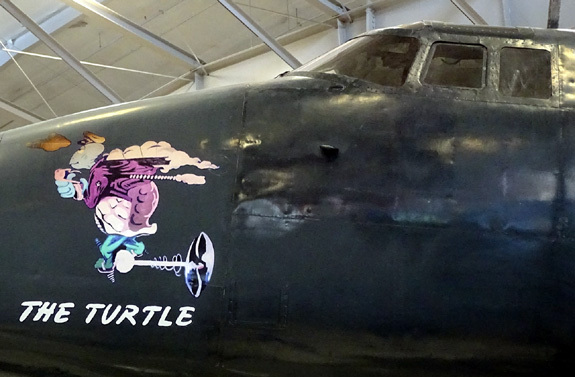 The "Truculent Turtle," a P2V Neptune, flew a record 11,235.6 miles without refueling in 1946. 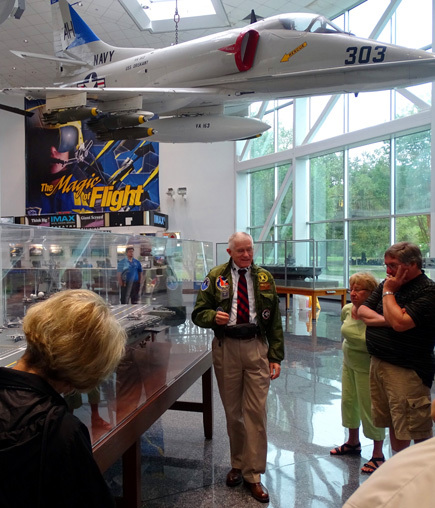 Jim inspects one of several aircraft with wings that fold to allow room for more on an aircraft carrier. That's a small sampling of what's on the first floor of the main building. The IMAX theater is also located there, a cafe, a children's play area, some simulators, and other things I've forgotten since my last visit. It's amazing how many different things are displayed on the balcony that surrounds the main floor. 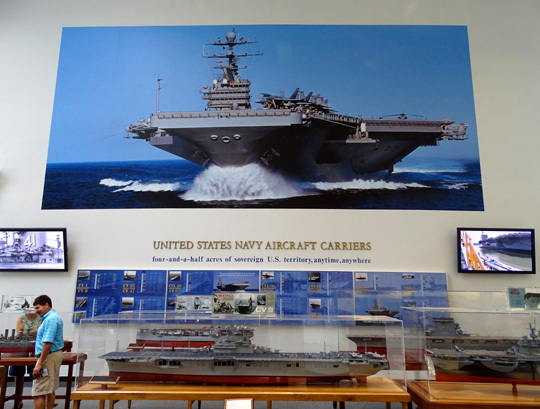 The aircraft carrier simulator we experienced is here. There is an interactive display regarding how weather conditions affect flight. 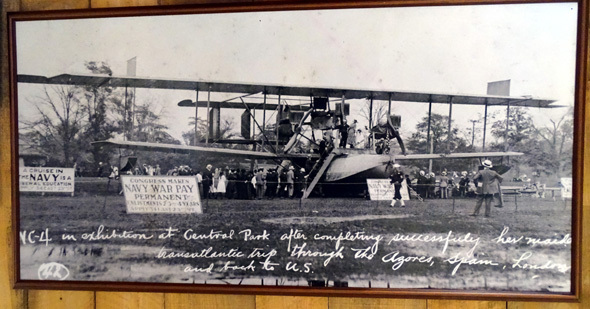 Aircraft art is displayed. 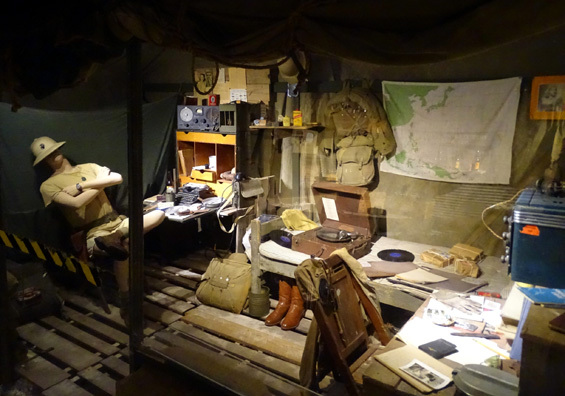 About one-quarter of the balcony's space is devoted to life-sized displays depicting a "slice of life" for military men and women at home and overseas during WWII. I probably enjoyed this section of the museum more than any other. 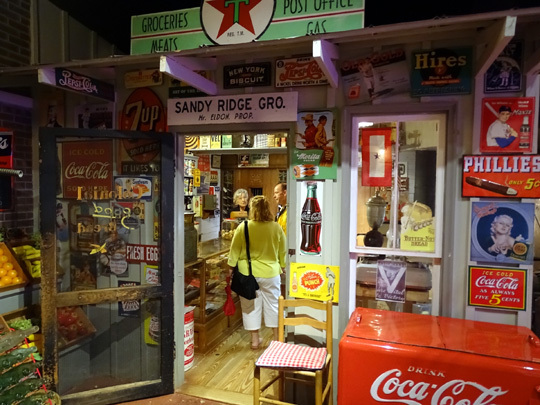 Visitors walk past the 1940s house and storefronts and can either walk into them or at least peer inside the windows at items from that era. 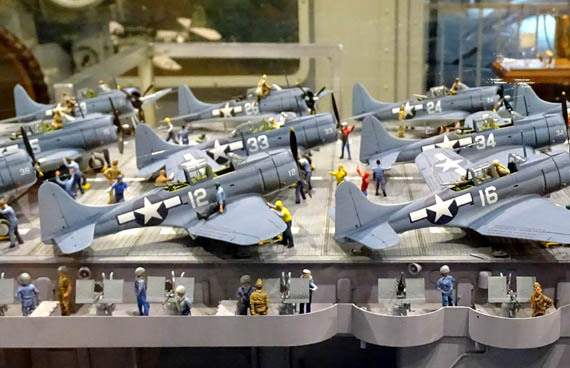 Other scenes depict life on board ships and land overseas during the war. 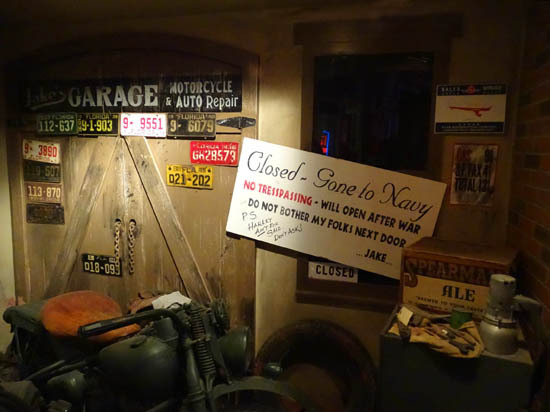 Depiction of a motorcycle and auto repair shop belonging to n man who left to fight the war. More than a storefront -- you can walk into this one (don't know if you can buy anything). quick "Navy showers" when we boondock and don't have water or sewer connections. 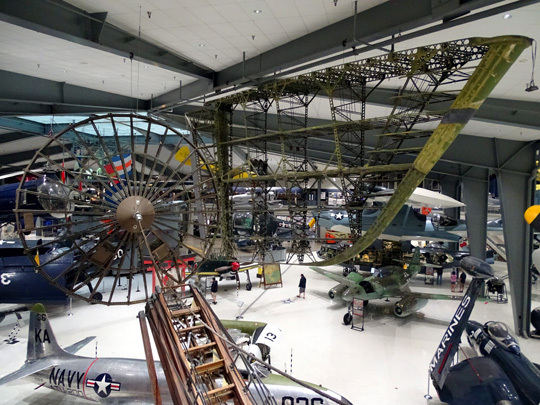 More recent aircraft and exhibits from the 1960s to the present are housed in a large hangar between the main museum and the flight line. that Presidents Nixon and Ford used. You can walk into the aircraft. 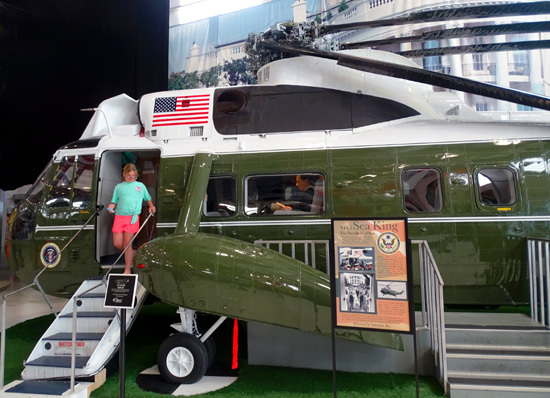 VH-1 Iroquois helicopter used in Viet Nam; Jim flew on one similar to this. from 1963-1987. 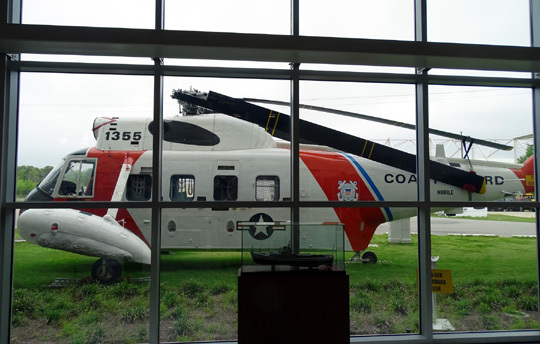 It sits outside the far end of the hangar; we just looked at it through the windows. 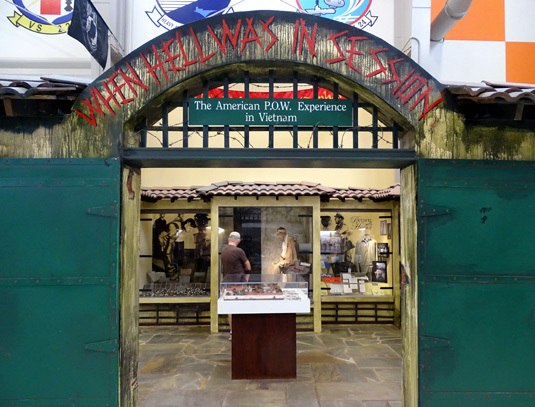 Jim was very interested in this graphic Viet Nam POW-MIA exhibit because he served there. There is much more than shown here, of course. I took dozens of photos of the museum during my four visits. I think Jim went another time by himself, too. Did I mention that he loves the place? 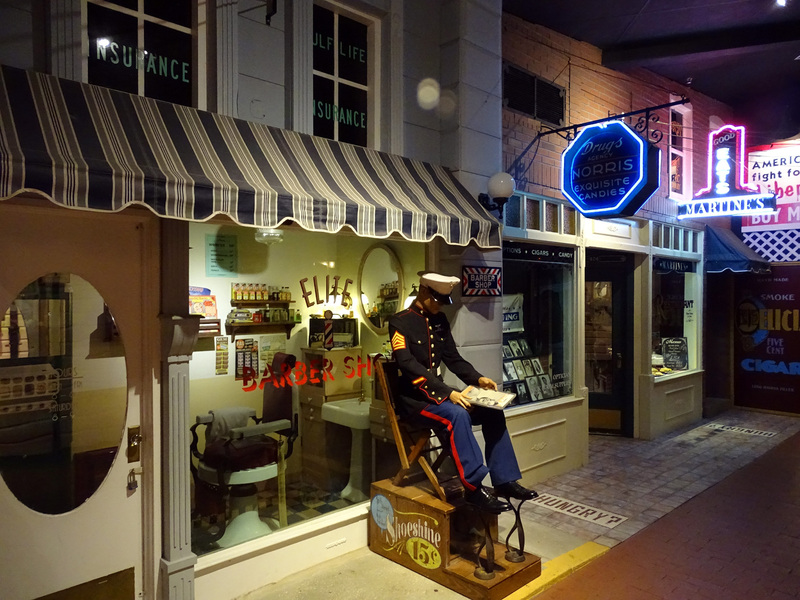 If we spend more time in Pensacola another winter, he'd like to train to be a volunteer at the museum. 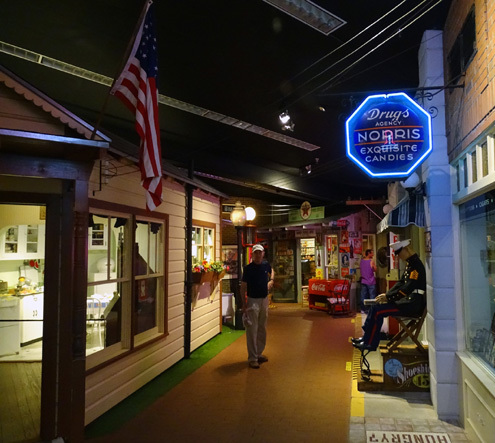 Word to the wise: if you're in the Pensacola area, go spend some time in this museum! !